The pilots of a Southwest Airlines jet struggled to control the plane after an engine blew apart at 32,000 feet over Pennsylvania last month. Investigators say the captain, Tammie Jo Shults, took over control from the co-pilot. She first asked air traffic controllers for permission to land at the nearest airport, but then aimed for Philadelphia, where the crippled plane made an emergency landing. A jagged chunk of an engine part called the inboard fan cowl hit a window, shattering it and causing a partial loss of pressure in the cabin that pushed 43-year-old Jennifer Riordan halfway out the window. The National Transportation Safety Board provided new details on Thursday on the fatal accident aboard Southwest Flight 1380 on April 17. Ms Shults and co-pilot Darren Ellisor, both former military pilots, have not talked publicly about the dramatic flight. They and other crew members and a few passengers met President Donald Trump in the White House on Tuesday, and Mr Trump praised their bravery and skill. In its update, the NTSB also said that investigators have found pieces of the broken engine fan blade suspected of triggering the accident when it snapped off due to metal fatigue, or microscopic cracking. The NTSB said the other blades in the engine on the Boeing 737 were nicked during the accident but showed no signs of cracking. 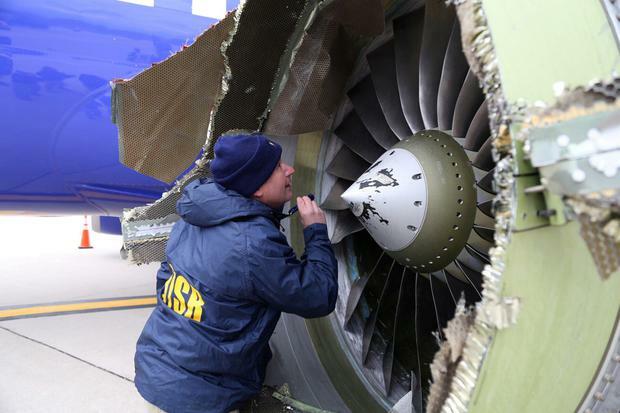 Investigators looked at Southwest maintenance records, which indicated that the fan blades in the failed engine had made more than 32,000 flights and more than 10,000 since being overhauled in November 2012. At that time they were inspected by sight and with fluorescent dye used to find surface defects. Since the accident, the Federal Aviation Administration has announced stepped-up inspections of fan blades in Boeing 737 engines, which are made by CFM International, a joint venture of General Electric Co and France's Safran SA. CFM first recommended more inspections using ultrasound and electrical currents after an engine broke apart on another Southwest plane in 2016. Southwest executives say crews have inspected more than 25,000 blades in the airline's fleet and found only one other that showed signs of cracking. Passengers on another Southwest plane were startled this week when one layer of a three-layer window cracked in flight. The pilots landed the plane safely in Cleveland.